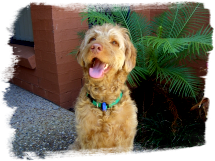 One of our own dogs, Monday, a Labradoodle, now retired assistance dog, was given to us years ago to raise and train for an assistance dog organization in Brisbane. Training went well but shortly before graduating from the training program Monday suddenly became very ill with an unexplained and very severe gastrointestinal problem that not only made her suffer ongoing bouts of vomiting but also caused her to stop eating and drinking as well as alarming weight loss in a very short time. At first the vets could not find out what was wrong with her, but eventually a certain blood test, as last resort, confirmed that she was suffering from a cell disorder, called Esosinophil Disorder, rare but not unknown in dogs. Monday was put on a high dosage of cortisone which started to help but we were also told she would need to continue with that for the rest of her life. Without it she could relapse and would most likely not survive. At the time she was only 12 months old. Not happy with this outlook we started researching about this illness and what could be done about it. We found out that this disorder is caused by certain food ingredients, usually in commercial diets, that the body cannot cope with and reacts very strongly to. And we also found out that this disorder, even if not curable, can be managed with the correct diet. In Monday’s case this meant a natural, balanced and complete raw diet. With this knowledge and more in-depth research we developed a first version of today’s Raw 4 Paws recipe for Monday. She liked it from day 1, started to recover, we could even wean her off the cortisone again completely. Now she is our “old” lady, 12 years old and still going strong, enjoying her Raw 4 Paws every day. After Monday’s recovery we were asked by people, who knew her story, what we did to help Monday and they also wanted to try the food – this is how Raw 4 Paws started. Over the years we developed and perfected the recipe further, also in co-operation with a certified canine nutritionist as well as a veterinarian interested in a more natural approach to canine diets. Raw 4 Paws has grown into a business dedicated to provide a premium quality raw diet for dogs and also cats, easy to use for pet owners who can offer a great choice to their pets, even to those with certain health requirements or allergies.